*This post is sponsored by The Home Depot. You can read my full disclosure policy here. Happy Monday, friends! I hope you all had a relaxing weekend. Fall finally showed its face down here in southeast Texas and we enjoyed some glorious temperatures on Saturday and especially Sunday. It was the first time since April that we turned the AC off and opened all of the windows. There’s nothing quite like that first fall breeze filling the house with fresh outside air. The grass had just been cut the day before and the lovely scent mixed with my fall candle was like heaven. Today, I am so excited to share a fun little project that I teamed up with The Home Depot for, as part of their Do-It Herself Workshops! Did you know that The Home Depot offers Workshops at all of their locations for do-it-yourselfers of all ages and experience levels? Customers can learn how to build décor projects, how to make easy home repairs and how to operate tools through demonstrations and step-by-step instructions. Awesome, right?! And the best part is that the there’s something for everyone in the family. There are three types of Workshops offered – Do-It-Yourself (DIY), Do-It-Herself (DIH) and Kids. Visit https://workshops.homedepot.com to learn more. 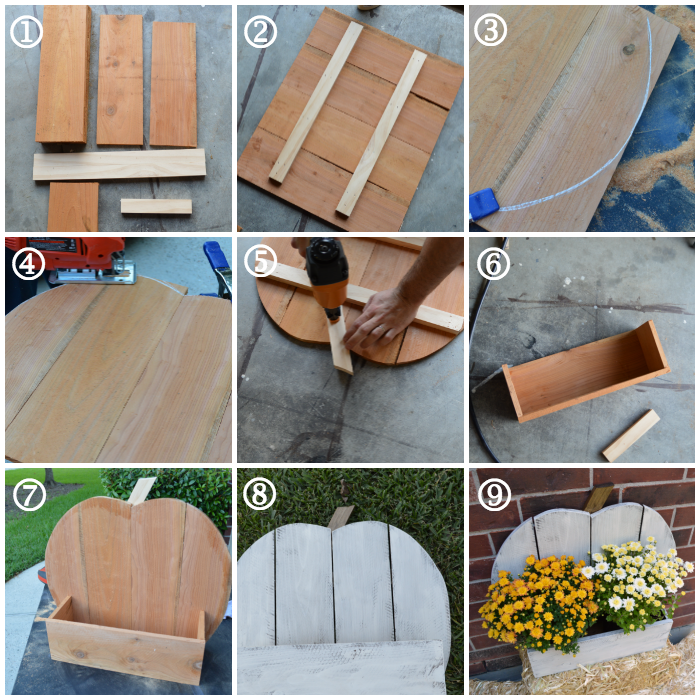 For this workshop we are building a Rustic Pumpkin Stand that you can use anywhere in the home. I chose to use mine as a stand to display my beautiful fall flowers. The stand is made out of fence pickets and a 1×2. It is super inexpensive and simple to put together. I decided to paint mine a distressed white so that my flowers would really pop. First, I stained the pickets so that the distressed part would really stand out. The fence pickets are so rough that I didn’t even have to sand the paint to achieve the distressed look. I just gently wiped with my paint brush making sure to leave some areas a little more exposed. I love working with fence pickets. I’m pretty sure they’re my current favorite project material. Want to create one of your own? 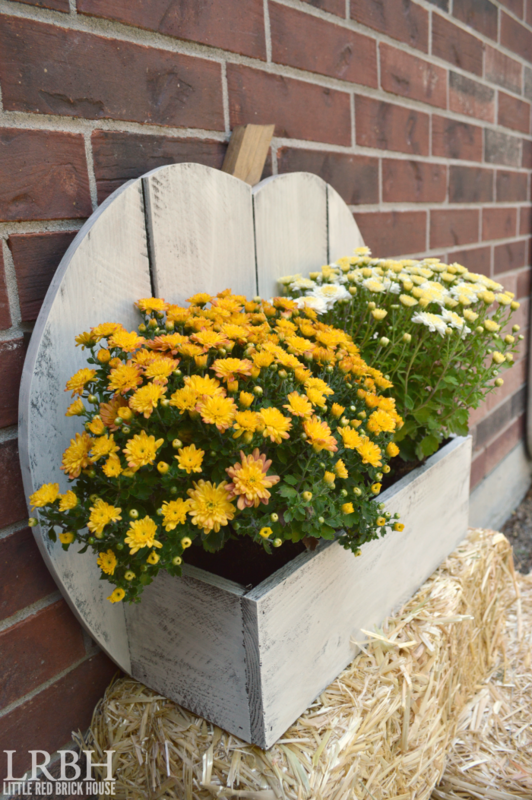 Be sure to register online to attend September 17th’s DIH Workshop! 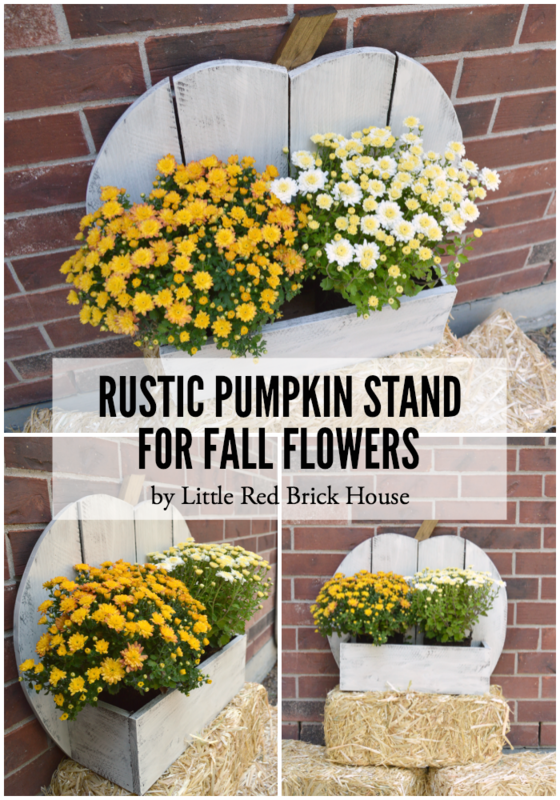 The possibilities of this little rustic pumpkin stand are endless. For even more inspiration, be sure to check out the ideas that each of these lovely bloggers came up with. The Home Depot’s Workshops are designed to provide a mix of associate-led instruction, demonstration, and some hands-on learning. Materials can be purchased to make your own project. For more information, contact your local Home Depot store. *I acknowledge that The Home Depot is partnering with me to participate in this Workshops Program (the “Program”). As a part of the Program, I am receiving compensation in the form of products and services, for the purpose of promoting The Home Depot. All expressed opinions and experiences are my own words. My post complies with the Word Of Mouth Marketing Association (WOMMA) Ethics Code and applicable Federal Trade Commission guidelines. I really like the shape you choose to make your pumpkin. Looks great with your mums! Thank you, Jamie! I was worried it would look too much like an apple, LOL. Love how your pumpkin stand turned out, Sarah. The finish you used is really nice! Happy Fall! Thank you so much, Alissa! I love the rustic white look you went for Sarah! Super cute! 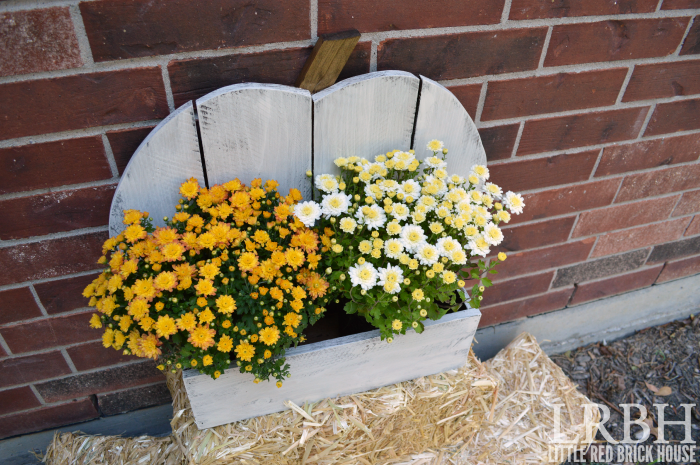 Beautiful – perfect for fall mums! Thank you, Karen! I’m loving the fall flowers! Mine is similar with the distressed white, gives it that rustic feel. I’ve never worked with fence posts before but it was a lot of fun. 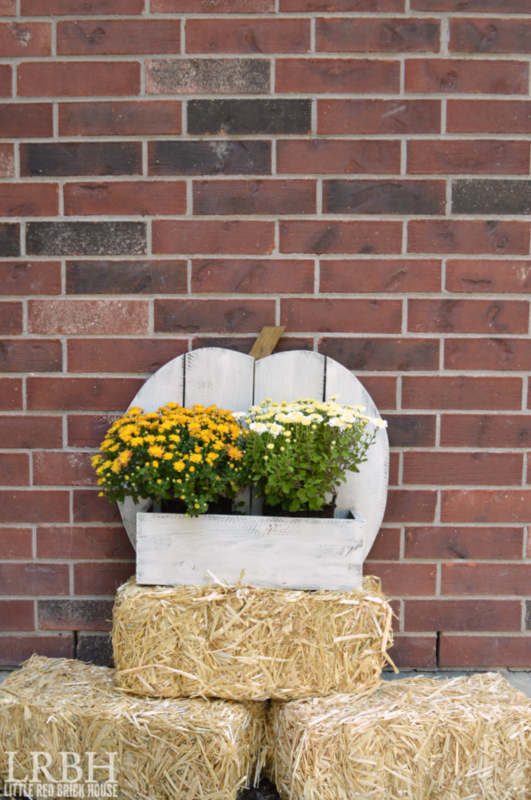 I love how you used it on a hay bale with some flowers. It is perfectly fall! Aren’t they so fun to work with? And cheap too! Thanks so much for stopping by! Thanks, Bre! You totally should try them out! They are perfectly rustic! I need one of these for my porch! Too cute, Sarah! Thanks, Amy! It was super easy to make! SOOOO want to make one of these! I think this is the cutest front porch addition for fall 🙂 Pinning too! Thank you, Erin! It really is such a fun little fall decor piece! Love this – very simple and love it with the plants in it. Saw this project elsewhere on another blog and she used small gourds in the box. Very cute! Thank you so much, Carole! I love how versatile it is. Gourds would be absolutely adorable! So pretty and I love it filled with flowers! Great DIY!! So fun to be on the tour with you 🙂 Pinning! Thank you so much, Heather! It was a fun little project, wasn’t it? 🙂 I appreciate the pin!